And if you’re not comfortable messing with the big day, don’t worry, these recipes are perfectly suited to any festive occasion. First up, it’s an impressive turkey wellington and, I have to admit, I’m proud of this one. Dad and I were talking about how some smaller families might not want a whole turkey, so we came up with this recipe. It looks fantastic and stretches the meat much further. The pastry and mushrooms wrap the meat to help hold its juices, and the best bit is that you can assemble it a day ahead and leave it in the fridge until you’re ready to cook. Next up, I’ve tackled that old favourite, the Christmas ham, but I’ve turned things on their head by using ham hocks, which are actually a lot easier to do. Believe it or not, jerk seasoning is Christmassy – the spices are pretty much the same ones you’ll find in mulled wine and mince pies. 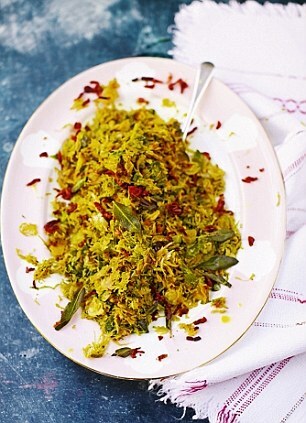 Finally, I’m giving a bit of love to the most debated veg we Brits cook at Christmas – Brussels sprouts. You either love or hate these little guys, but I hope that trying them in a new way will change your opinion if you’re in the haters crowd. They’re super quick too – you just rattle them through your food processor and get them into a pan with some gorgeous flavours. Happy days. Preheat the oven to 180°C/gas 4. Place the clementine zest and juice, cloves, cinnamon and sugar in a small pan and simmer over a very low heat for 4-5 minutes, then remove the cloves and cinnamon. Add the cranberries and cook until rehydrated, then turn off the heat and leave to cool. Once cooled, blitz briefly in a food processor or with a hand blender. Place the turkey breast skin-side down on a board. Gently slice into the natural join of the breast muscle to open it out, season well and drizzle with olive oil. Spread an even layer of the cranberry mixture over the breast, pushing it into the nooks and crannies, then sprinkle over half the thyme. Fold the breast back into shape to seal the mixture inside, and push a couple of cocktail sticks into the edge to keep it together. Season the outside of the turkey with the lemon zest, the remaining thyme, a small pinch of salt and pepper and a drizzle of oil. Rub it all into the skin, then transfer to a roasting tray, cover in foil and roast for 60-70 minutes, or until just cooked through. Meanwhile, for the stuffing, soak the porcini in a cup of just-boiled water. After 5 minutes, stir with a fork so any grit sinks to the bottom. Fry the bacon and thyme in a pan with a splash of oil over a medium heat for 5-10 minutes, or until golden and crispy. Remove from the pan with a slotted spoon and set aside. Add the garlic, sage, onions and drained porcini to the pan and fry for a couple of minutes, till the porcini start sizzling. Add the fresh mushrooms and continue to cook for 15-20 minutes until golden, soft and sticky with caramelly edges. When the pan is dry, add a good swig of marsala and continue to cook until it’s evaporated. Stir in the butter till combined, then season. Transfer to a food processor and blitz till it’s a mixture of smooth and chunky. Leave to cool. 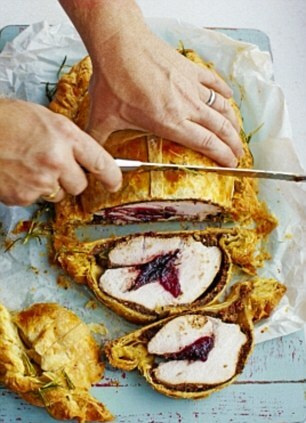 Once the turkey and stuffing have cooled, assemble the wellington. Heat the oven to 180°C/gas 4. Roll out each pack of pastry to roughly the size of an A3 sheet of paper (one lot will be the base, and the other the lid). Spread half the mushroom stuffing over the middle of the base in an area the size of your turkey breast. Place the breast on top and spread the remaining stuffing over the breast so all of it is covered. Lay the second sheet of pastry over the top and mould it around the breast, gently pushing down to seal the edges. If you’re left with lots of pastry at the sides, trim it to around 5cm (2in) then twist and tuck around the edges (like in the picture). Preheat the oven to 180°C/gas 4. For the jerk seasoning, blitz everything in a food processor until smooth. 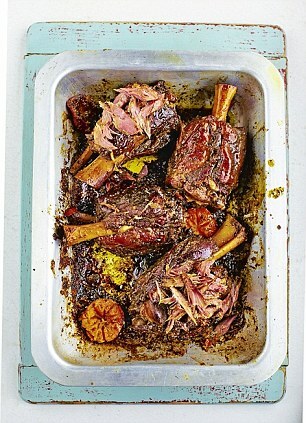 Rub the seasoning all over the hocks, drizzle with oil, then place in a roasting tray. Add the clementine halves then cover the tray with tin foil. Roast for about 3½ hours, until the meat is tender and falling off the bone. Once cooked, squeeze the clementines over the hocks, then shred the ham with forks, discarding bones and any wobbly bits of fat. Serve hot, or keep the meat in the fridge and serve cold later. Any leftovers can be pressed into a terrine, crisped up in a pan and tossed through salad, or used to make sandwiches with limey mayo and cheese. Push the sprouts through the fine slicing attachment of a food processor, then fill the bowl with water. Add a good drizzle of olive oil and the butter to a large pan over a medium heat. Add the bacon, sage and a pinch of salt and pepper and cook for 5-10 minutes, or until lovely and crisp. Drain the sprouts, add to the pan and turn the heat up – it doesn’t matter if they’re still a bit wet, that will help them steam. Fry for 10 minutes or till soft. Add a splash of water if needed. Add the Worcestershire sauce, toss it all together then turn the heat off. Add the garlic – you really want that hum of raw garlic – then give it another good stir and serve straight away.